Once in a while we stumble in on ‘small’ meets such as the Wise Guys’ Cars and Coffee. The Wise Guys is a barbershop somewhere in Kellyville, where apparently a huge amount of petrolheads resides. As such, many of them visit the Wise Guys’ to get their fades looking fresh. The Wise Guys’ owners are motor maniacs themselves, so lo and behold, a monthly Cars on the Avenue meet was born. We drop into one and see what the fuss is all about. Ah, the Mitsubishi Lancer Evolution. A line of fast four doors that’s secured its place in motorsports, both professional and amateur, every incarnation is a force to be reckon with. Shaun’s Evo 6 is no different; it’s armed to the teeth with power and handling. The bulletproof 4G63 works with a set of GSC S2 camshafts, MXP V2 manifold, a Tommi Makinen turbo with upgraded titanium wheel, and a Plazmaman intercooler piping kit to pump out 240kW on E85 at all four wheels. To keep it all reliable, it runs a coil-on-plug kit, an AT Performance catch can, and a AEM wideband gauge to keep an eye on the air fuel ratio. Built to attack the track and skidpan, handling is also important. He’s sorted it out with a MFactory helical front LSD, RS rear differential conversion, Whiteline swaybars front and rear, and finished off with MCA’s XR coilovers, designed for track and street use. The Focus RS has been threatening the ranks of super hatches for the past few generations, and now with the third gen, it comes out swinging with the big guns. Jack has obviously sat up and taken noticed, selling his modified Golf R Mk6 in favour of this nitrous blue blooded Ford. As a big fan of motorsports, he’s got his work cut out. Straight away, the stock suspension was chucked out in favour of KW Competition shocks, Suspension Concepts custom camber tops, Hardrace camber and toe arms, and front roll centre adjuster. A Hambini short shifter helps Jack snap through gearchanges. To hold him down, Sparco Pro2000 bucket seats were installed, alongside a customs Bond’s half cage for safety and stiffening the chassis. 18in x 9in wide Koya wheels shod with sticky A050 rubber complete the ready-to-race package. 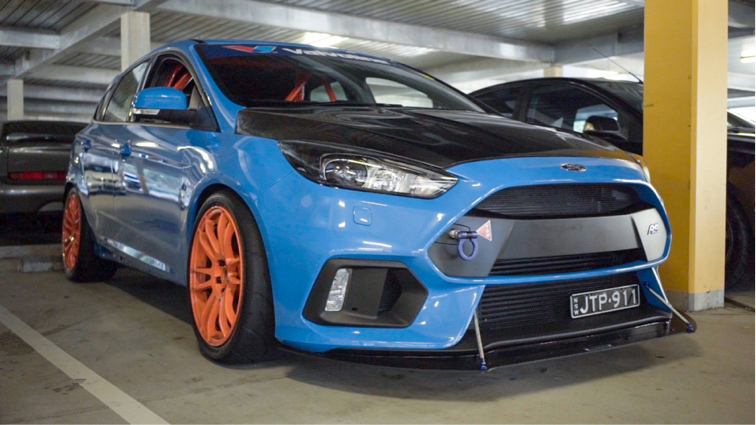 Move over XR6 Turbos, the new fast Ford is here. 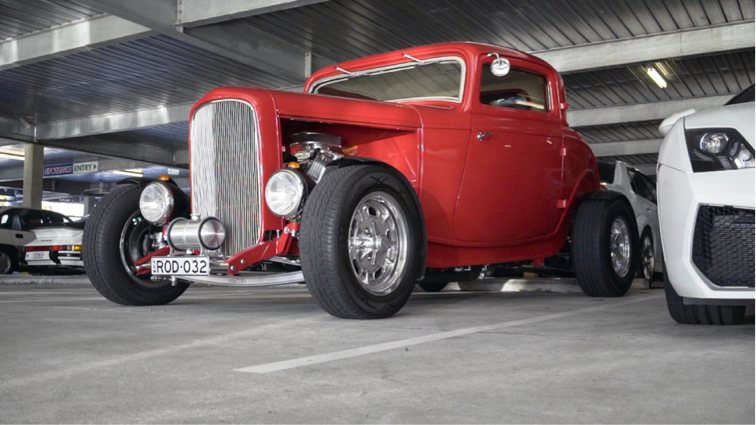 The legendary Ford ‘Deuce’ Coupe…it has been immortalized in the film American Graffiti and countless songs. The 1932 Ford Model B was sought after by many young men after World War 2, as it was a cheap V8 equipped car to modify. The Coupe was the most desirable model; compact, purposeful and easily modified in a variety of ways to go fast, also known as hot rodding. To have a hot rod is slang for a modified car in the good ol’ days. Now extremely rare, Ford Coupes like these draw attention like nobody else, and invariably the owner is usually an older gentleman with fond memories of the 50s and 60s before the muscle car craze. As such the Ford here has been immaculately restored to its glory days, with fender deletes to showcase the thumping V8 under the long bonnet. And of course, it’s got to be red, the fastest colour in cars. Big quick luxobarges are often the domain of German automakers, but you can’t deny that Toyota has made a few decent ones too in the 90s. 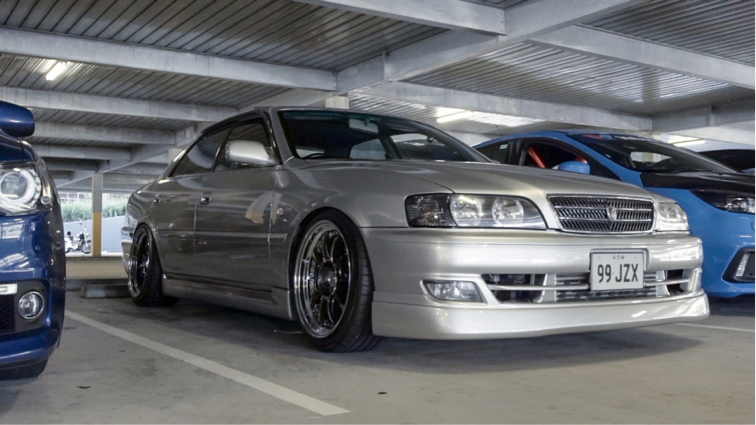 Luke’s 1999 Toyota Chaser is one of them. That big square sedan look is unmistakeably Japanese. Inside is a plush interior that’ll rival any European make in terms of quality and features. Fitted with a rare Traum bodykit, the JZX100 looks every bit a Wangan uber-cruiser. Lowered on MCA Purple coilovers, wide and big SSR SP5 wheels, the big sedan handles sweetly thanks bigger Cusco front and rear sway bars. With the steering abilities sorted, Luke revealed that his stash of go faster bits include a bigger Garrett GTX 3076 turbo, full Bosch fuel setup, and an aftermarket Haltech ECU to help punch out 400hp reliably from the straight six turbo motor. 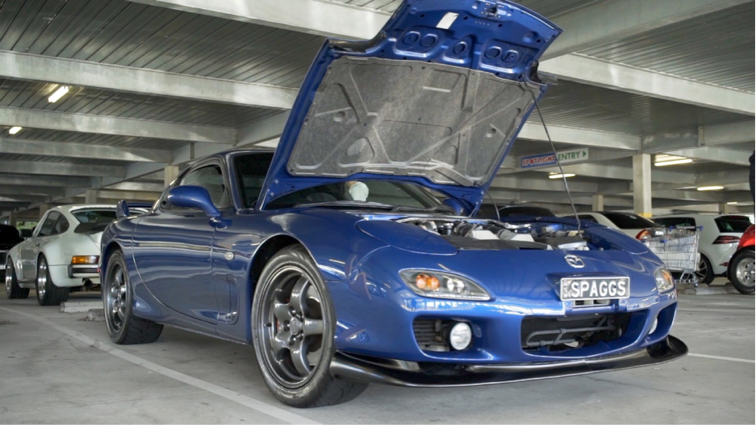 Finding a mint Mazda RX-7 is always a treat for us. Adrian’s Series 8 is a modified example that retains that sweet curvy shape, while packing some power under the bonnet. He’s left the exterior pretty stock, but what drew our attention is the magical spinning double Doritos under the bonnet. The fiddly factory sequential turbo setup has been binned in favour of a big Borgwarner EFR single turbo. Keeping tabs on the air pressure is a TurboSmart Hypergate 45mm wastegate, and cooling the intake charge is an AutoExe intercooler system. The original 13B has been pulled apart and given a mild port before getting refurbished for a long lifetime of service. The two stroke magic of converting air and fuel into power and fumes are funnelled out the back with a 3in full exhaust system. Looking after everything is a Haltech ECU, still on a run in tune. Adrian expects a lot more than 400hp, which was what the previous engine setup ran. Swapping a modern, lightweight, powerful, and affordable V8 into a muscle car of choice has never been so easy. It’s so easy, in fact, it’s become something like the Midas touch. Nearly any car in the world has an example where the General Motors LS-series motor has been shoehorned in. And here is just one; a KE30 Toyota Corolla with a worked LS V8 shoehorned into its tiny tiny engine bay. With an increase of over five times the capacity, and nearly six times the horsepower, the Corolla underwent major surgery to make sure it could put every HP to use on the drag strip or road. The rear has been fitted with a custom ladder chassis and suspension setup, as well as drag slicks for maximum traction. Ensuring nothing goes boom when the clutch drops is a 9in rear differential. 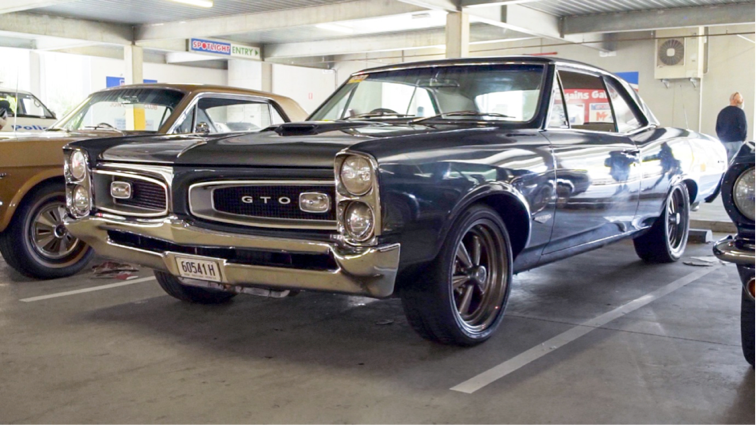 One of a kind probably doesn’t describe Rob’s 1966 Pontiac GTO…how about one in a million? This is an incredibly rare, right hand drive conversion, sold brand new in Australia back in the muscle car heydays of the sixties. That’s right, no yellow plate VINs here, it’s true Aussie blue. It’s been repainted in charcoal blue and the interior has been restored immaculately. Under the bonnet, it’s rocks the factory 389ci XS block, which is a rare factory option, even in the US of the A. Keeping it period correct are 3x2 barrel Rochester ‘Ram Air’ carburettors as the only engine mod, and swapping out the stock rims for Cragar SS ones. 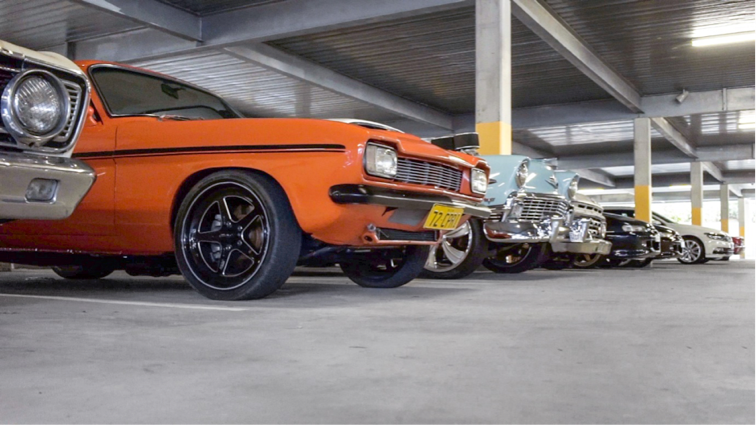 Meticulously kept, Rob’s ‘Daddy’ of muscle cars turns heads whenever he takes it out for a drive. Last edited by MotorCulture; 02-08-18 at 09:52 PM.